Great to see v4.0 in my app updates. It looks fantastic! Only exception is in my preferred view, artwork with four columns, the sizing doesn't match the new resolution. As always, thanks! Love both the desktop program and the app! You should state your device and iOS version, to help Ken. I am running the iOS 11 beta on an iPad Pro and all three Showcase views (3, 4 and 5 columns) look fine. I'm using an iPhone 6s on iOS 10.3.3. Edit to add: the Amazon link in the wishlist is a nice touch. I'm looking forward to any other discoveries. With 4.0, I cannot select anything under 'Collection' without the app freezing and hanging before booting back to main. Running 4.0 on an iPad Pro 10.5" IOS 11. When doing a database update/download the progress bar for images extends past the right boundary of the box. I have a screen grab, but don't know how to attach it to the problem report. Running 4.0 on iOS 9.3.5 iPod Touch 5. I can load the app, but it is frozen on Collection main menu and cannot select any collections or items on the bottom bar. I completely deleted the app off my device and re-installed it from the app store - then did a full Database update sync from DVD Profiler 4.0 Windows desktop app - and it was working. But then I switched to full Thumbnail view of my collection - and it's freezing and crashing the entire app, not letting me do anything further. 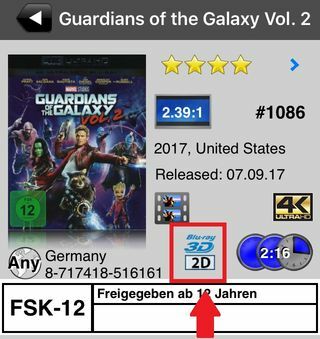 not sure if its a bug but Running 4.0 on iOS 9.3.5 iPad Mini (1st generation) when i click to see the upc, they all shows up as 3D Blurays with 4K or DVDs with 3D? Same here. All titles are 2D/3D. 4K only where ticked in the PC-App. iPhone 7, iOS 11 GM. Same for me, even without sync after updating to 4.0. Also, there is still the old iOS style back arrow in the picture. Cannot update databases (sync) on iOS devices to my master PC database, the 4.0 app crashes (stops running in foreground, but is still running in background, have to manually force quit it). I tried deleting the app entirely, rebooting the devices, and reinstalling the app from scratch, but this did not resolve the issue. Also switching between collection views caused the app to freeze and then crash, as others have previously reported above. The lower menu bar with the Move/Personalize buttons has disappeared on my iPad Pro 12.9 on iOS 11. Works fine on my iPhone 6 Plus, though.